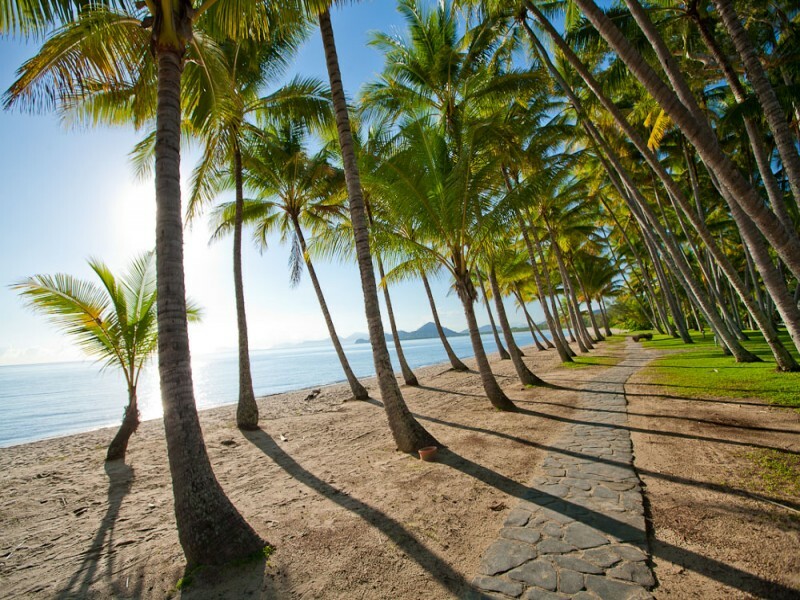 Palm Cove is a picturesque town known for its palm-lined beach, laid-back atmosphere, and proximity to the Great Barrier Reef. 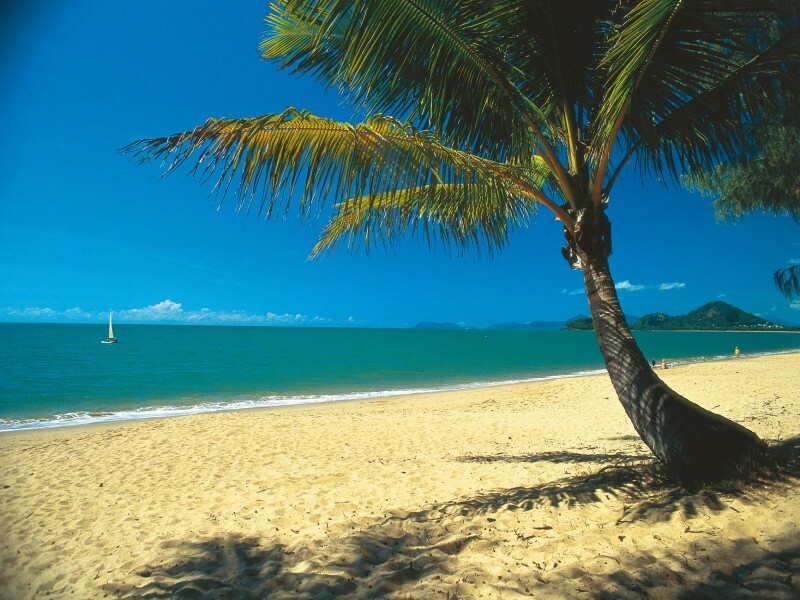 Just 20 minutes from Tropical North Queensland mecca Cairns, Palm Cove is easily accessible via car, transfer, or bus. You’ll be glad you made the trip once the sparling azure waters lapping white sand beaches appear and the tranquillity instantly overwhelms and relaxes you. 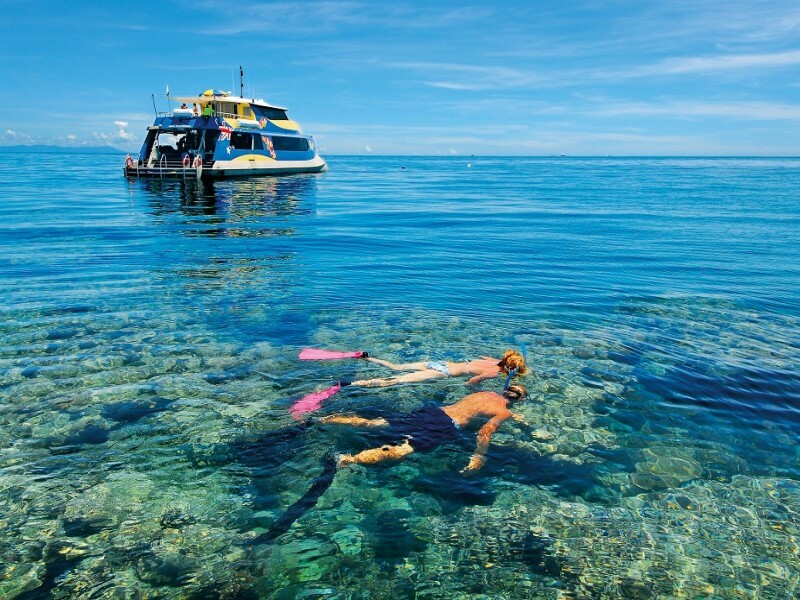 Palm Cove days consist of lazing on the pristine beaches, diving or snorkelling through the Great Barrier Reef accompanied by tropical fish, relaxing into a divine body scrub or massage, and choosing between dining options fit for a king! 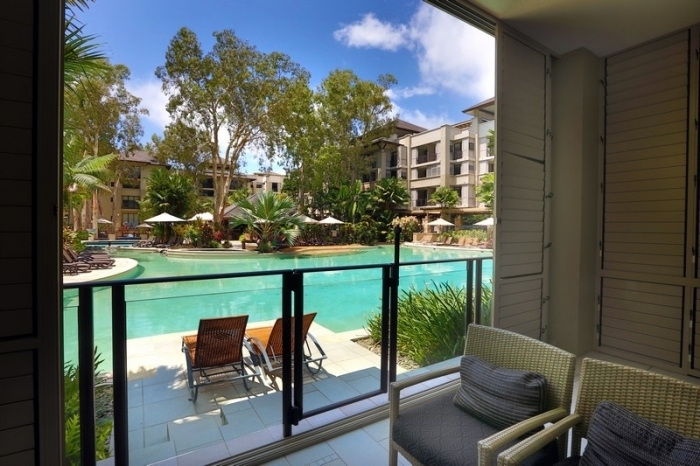 An array of luxurious Palm Cove accommodation options are sprinkled throughout the sleepy sea-side town that are complemented by gorgeous boutique shops, restaurants, and spas that are sure to reinvigorate a love of life, sun, and sand. If your idea of paradise includes 5 star luxury then we highly recommend the Sea Temple Private Apartments. 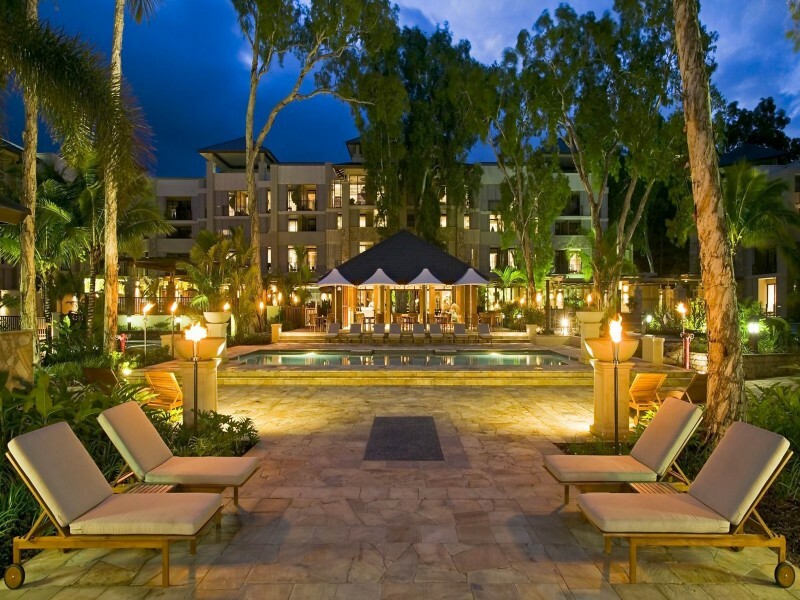 This resort will take your breath away the moment you enter and the expansive lagoon complete with tropical gardens, lights, and sun decks appear. The sophistication continues as you meet the professional, yet lovely staff and see the spacious apartments. Managed by Boutique Collection, this resort takes impressing their guests to a whole new level with beautiful spacious apartments that come in a variety of offerings including studio, 1, 2 and, 3 bedroom apartments as well as 2 bedroom penthouse apartments to private BBQ, spa, swim up, plunge pool rooms. So you can experience luxury however you prefer. As a private collection, only the best apartments have been selected to be a part of the Boutique Collection and are managed separately to the resort therefore offering all of the resort facilities alongside additional services. The one exception being you are unable to charge items to your room. You are welcomed at the offsite office located just 5 minutes down the road from the resort and are personally shown to your apartment. Families will love the gourmet kitchen in each of the apartment options (the studio offers a kitchenette) as you can share some meals such as cereal for breakfast, simple lunches, or evening BBQ’s on the beautiful deck to help with your budgeting. You can also prepare lunches to eat out while you’re on the go traversing about the insanely beautiful Palm Cove. The penthouse apartment’s feature premier resort comfort for exception value. These apartments boast their own private roof top entertainment areas including spa so you can enjoy a BBQ before settling into the spa to watch the sunset over the perfect, palm-lined beach, cocktail in hand. 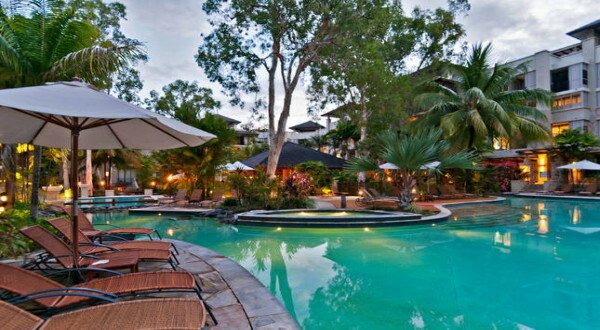 Restaurants are available in abundance in the Sea Temple Palm Cove from the casual pool bar to the Temple of Tastes restaurant that offers both indoor and outdoor dining and a delightful array of cuisine. Step out of the resort and you will be met with a variety of dining options including a Hightide favourite the Beach Almond Beach House who deliver fresh, locally sourced seafood with Asian inspiration. Situated in Tropical North Queensland Palm Cove has bucket loads of natural beauties to explore on land and out at sea including rainforest exploration, animal encounters, sky rail rides, Great Barrier Reef trips to snorkel or dive, glass bottom boat expeditions, tropical hiking, golf, adrenalin pumping water sports, stand up paddle boarding and kayaking, casual or game fishing and much more. Our Hightide Hot Tip is to spend at least one day heading out to the reef in style with either Sunlover or Quiksilver Reef Pontoons. Board the air-conditioned, WiFi-equipped catamaran between 9am to 10am to be escorted in comfort to your tropical destination where you can jump out and snorkel or dive in the safety of an enclosed area with the colourful fish and breathtaking coral reef. You can also explore the on board touch tank, get up close and personal with the marine life via a semi-submersible, or take a glass bottom boat tour before enjoying a delicious buffet lunch. 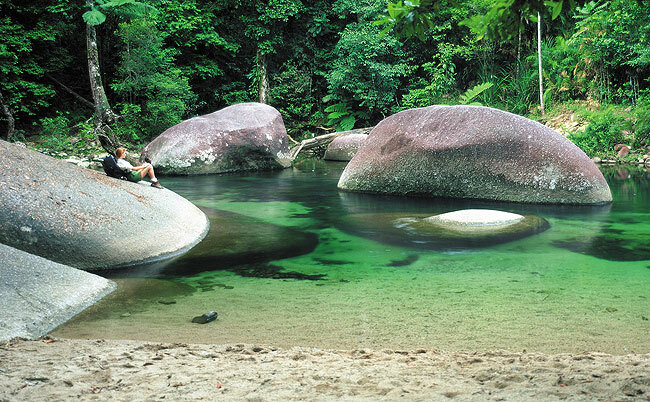 Unforgettable land experiences are easy to find on the edge of the luscious Daintree Rainforest that hoards beauty by the tonne. Venture on one of the many nature walks and see the native flora and fauna for yourself. Or you can explore the Atherton Tablelands for an equally as beautiful experience that features a cooler climate paired with rolling green pastures and waterfalls such as the famous Milla Milla Falls. Travel just 20 minutes north and you’ll find yourself in Cairns where the Tropical Zoo and it’s plethora of amazing animals awaits to please both adults and children alike. For a slightly more adventurous experience Hartley’s Crocodile Adventures offers a unique method for getting in touch with the natives. 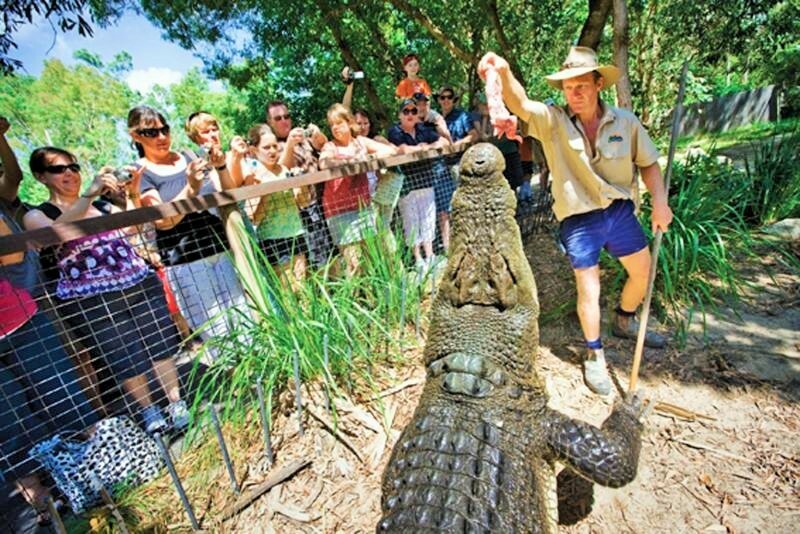 This education experience takes you down the river to see reptiles in their natural habitats and has won the Tropical North Queensland tourism award – making it well worth the trip! Another fantastic animal attraction is the Australian Butterfly Sanctuary, this gem is located a short drive north of Palm Cove and is the country’s largest butterfly exhibit boasting over 1500 species of the beautiful winged creatures. You can learn about them on a 30 minute guided tour that kids absolutely love. While you’re in the area, the Kuranda Markets are just next door and feature local produce, arts and craft, heaps of yummy local food, fashion and much more. 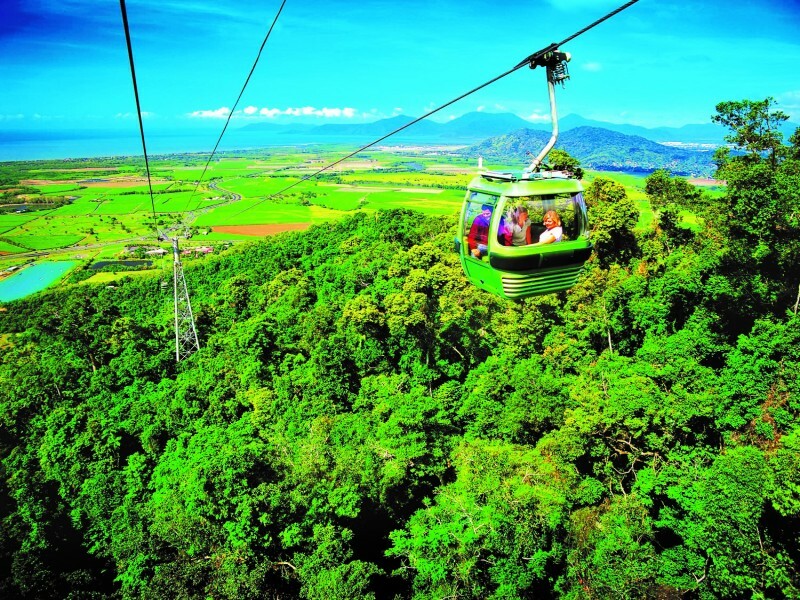 Of course the Kuranda Sky Rail Rainforest Cableway is another huge attraction in the area and has been voted Australia’s Best Major Tourist Attraction – which is quite the feat and well worth it if you ask us! Jump aboard the 6 person gondola to be floated 7.5 metres above canopies, deep into the forest where you are immersed in the rainforest and able to gaze upon it from an entirely new perspective! There are several stops along the way to stretch your legs and explore the rainforest from ground level along boardwalks, see the look outs, and venture through the Rainforest Interpretation Centre. After your exploration out into the coastal and rainforest bliss that is Palm Cove you can retreat back into comfort and luxury in the Sea Temple for an afternoon of relaxation, cocktails, and amazing food. Each apartment has WiFi so you can update your loved ones on your adventures. You can also drop by the day spa and be pampered anyway you like as they have a wide range of treatments available from scrubs and massages to facials and body waxing. Keep up your fitness routine while you’re away in the resort’s fully equipped gym or absorb the region’s beauty via a beach run – the choice is yours! Palm Cove is a slice of coastal bliss just waiting to soak up your stress and worries and turn them into a thing of the past! Long sandy, palm-lined beaches framed by luscious rainforest and colourful reef will keep you impressed and entertained while the Sea Temple Palm Cove will keep you comfortable and relaxed. Speak to Hightide Holidays today to organise your next holiday in paradise.